TEYR and The Twisted Twenty join forces for a spellbinding double bill full of tales, melodies and musical journeys. Their tour takes them across the south of the UK, stopping off at in Abergavenny, Somerset, West Cornwall and London next week. The concerts are a rare opportunity for collaboration between bands exploring two radically different perspectives on British folk music. Folk trio TEYR evolved out of London’s thriving session scene, combining bothy ballads, focsle shanties, folk tunes and Irish poetry. Their unique blend of voices and instruments draws links between the many sounds of the Celtic and British isles. Through a mutual love of reworking folk music TEYR came to play with baroque-folk ensemble The Twisted Twenty. The latter are known for their interpretation of early folk music from the 18th century and before. Using original period instruments they blur the lines between what we consider folk and classical, creating new sounds and meaning for British music. 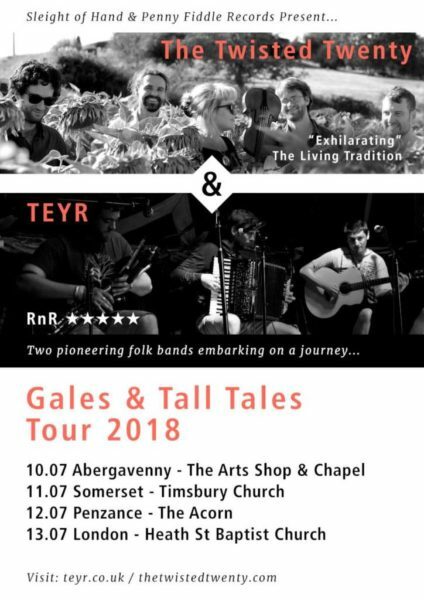 This summer they are thrilled to collaborate to bring you the Gales and Tall Tales Tour 2018. Come explore new and old ley lines through traditional musics. Wed 15th July : Karen Tweed teaching in Droitwich. Thurs 16th July : Karen Tweed teaching in Droitwich. Fri 17th July – Sun 19th July : Karen Tweed at Paddy and Anne Molloy weekend, playing with The Headers (Sat evening) Birmingham and teaching. Thurs 23rd July : CRUTHU LONGFORD (Arts Festival), Ireland until Sun 26th July. Karen Tweed playing, talking and exhibiting! Sun 9th August : Karen Tweed & Thomas McElvogue playing as part of Moya Brennan and Tim Jarvis’ Family Band evening at Leo’s Tavern, Donegal. 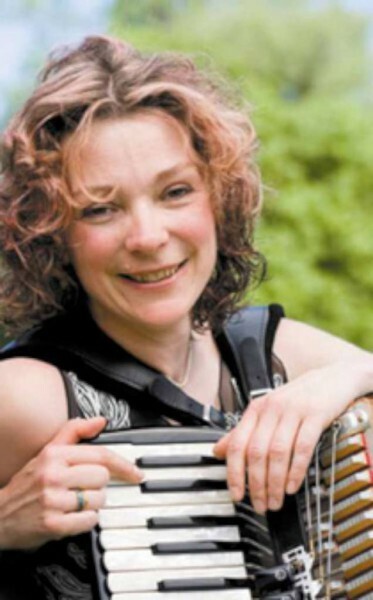 accordionist and composer now based in Roscommon, Ireland). A gentle (no experience necessary) barn dance – fancy dress optional (prizes for under 8 years, under 16 years and over 16s). Music by Karen Tweed (accordion), Mark Hickman (guitar and voice), Lorna Brownswood (flute) and caller Ian Watterson. Fancy dress optional on the theme of Shipwrecks and Sailors. . . you can come as the Mary Rose, a crab or a lobster pot or pirate, for example. . .
Sun 16th August – Mon 17th August : KarenTweed/Thomas / Dad at the Fleadh, Sligo.
.(Sunday Afternoon) : Bunch of Keys Book Launch.